THE B-MOVIE NEWS VAULT: SHOUT! FACTORY"S "BLACK & WHITE: DAWN OF ASSAULT" SPECS & EXTRAS! SHOUT! FACTORY"S "BLACK & WHITE: DAWN OF ASSAULT" SPECS & EXTRAS! SHOUT! FACTORY BRINGS THE ACTION-PACKED PREQUEL TO "BLACK & WHITE" TO NORTH AMERICA ON AUGUST 4TH! I'm a sucker for Asian action cinema, so this looks like something I'll def have to check out! And since this is the prequel, then one has to wonder if a North American release for the original BLACK & WHITE will be far behind. Film Synopsis: They're the last hope to save Harbour City... if they don't kill each other first. When a maverick cop and a gangster headed for retirement team up, sparks will fly and heads will roll in BLACK & WHITE: THE DAWN OF ASSAULT! Suspended detective Wu finds himself back in the thick of things when he crosses paths with Triad member Xu, who's looking to unload a stash of hot diamonds. When Xu's deal turns into a shoot-out and the diamonds go missing, the cop and the criminal reluctantly join forces to retrieve them. Before long they find themselves not only to be the hunters, but the hunted as their mission escalates into something bigger and more dangerous than they'd ever expected! 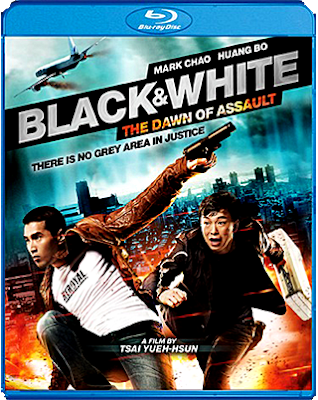 Delivering blockbuster movie entertainment, BLACK & WHITE: DAWN OF ASSAULT puts its own spin on the classic buddy cop formula, filling this outrageous actioner to the brim with over-the-top stunts, government conspiracies, and weapons of mass destruction. The Making of BLACK & WHITE: DAWN OF ASSAULT. BLACK & WHITE: DAWN OF ASSAULT will be available on Blu-ray and DVD on August 4th wherever discs are sold. You can get yourself a copy directly from SHOUT! FACTORY's online store, or pick it up from AMAZON.COM! Scope out the trailer below to see if this is something you'd want to add to 'your personal movie collection!